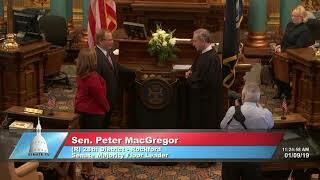 Senator Peter MacGregor took the oath of office for the Michigan Senate on January 9, 2019. 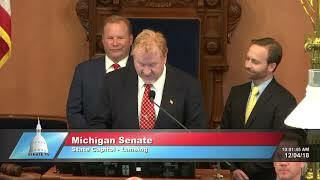 Senator Peter MacGregor, R-Rockford, welcomed Pastor Skip Meyer of Ballard Church of Christ in Sparta to the Michigan Senate to deliver the invocation at the start of the Dec. 4, 2018 session. 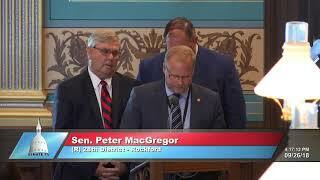 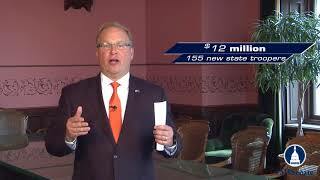 Senator Peter MacGregor, R-Rockford, discusses the FY 2019 Michigan budget. 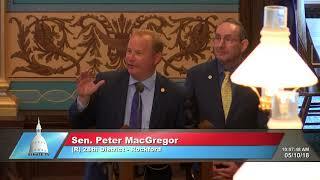 Senator Peter MacGregor, R-Rockford, recognized the Godwin Heights Marching BAnd for their 2017 state championship at the Michigan Senate during the May 10, 2018 session.